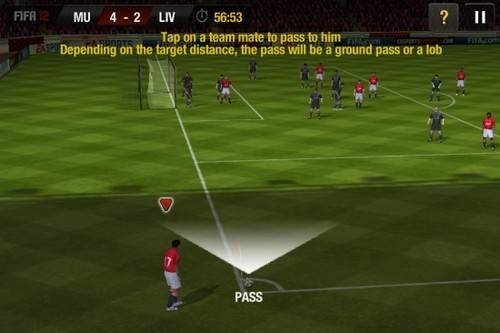 For those with an iOS device that enjoy playing mobile games, over here in the UK the football season has now kicked off, and those that wish to get their fix of football gaming can now purchase the FIFA SOCCER 12 app for the iPhone and Apple iPad from the App Store. Obviously unlike the football over in the States, the FIFA SOCCER 12 app offers English football to iOS gamers, and the guys over at iDownload Blog have given the FIFA SOCCER 12 app the once over and say the overall look of the game is impressive although the in game graphics wont turn any heads. The artwork in the main menu is “console worthy “ but when it comes to gameplay graphics that’s another story with pixelated player faces and blocky backgrounds, but the use of smooth payer animations and lighting almost makes the gamer forget about low-grade visuals. The guys bottom line is if you are not a fan of English soccer then FIFA SOCCER 12 probably wont make you change you mind, but for those heavily into the beautiful game this will no doubt be the game to grab. The FIFA SOCCER 12 app for the iPhone and Apple iPad offers over 22 officially licensed leagues, 500 licensed teams and in excess of 15,000 players, you can trade players, upgrade staff, scout for talent, and collect trophies, along with numerous modes such as practice, quick match, manager mode, and penalty kicks. For those that wish to grab the FIFA SOCCER 12 app, the game costs $4.99 for the iPhone and costs $9.99 for the Apple iPad, both of course can be downloaded from iTunes. For those that would like to check out some of the goal scoring gameplay on FIFA SCOCCER 12 we have a quick video below for your viewing consideration courtesy of Gamespot that lasts just on four and a half minutes…enjoy.